IT‘S soirée antillaise 16th year anniversary NYC’s LONGEST RUNNING EVENT, WE INVITE YOU TO JOIN US AND HELP US CELEBRATE. WE HAVE THE HONOR OF PRESENTING TO YOU ZENGLEN ON STAGE, HMI’s HOTTEST BAND RIGHT NOW. ZENGLEN OUR GIFT TO YOU THE SUPPORTERS AND OUR GIFT FROM YOU WILL BE YOUR PRESENCE. WE THANK YOU FOR SUPPORTING US THROUGH THE YEARS. 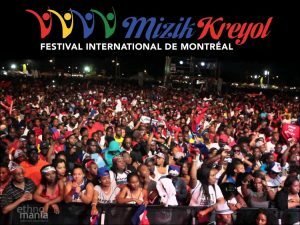 July 19-21, 2019: The Mizik Kreyol Festival (FIMKM) is a festive, family-friendly and unifying event with the best groups of Haitian and West Indian music of the hour. We are expecting more than 30,000 people from different Montreal communities on the site, especially families, youth and adults of all ages. In addition to offering a dream program to all our participants, we also offer them an event for the whole family, with activities planned for all: food and drink kiosks, on-site entertainment, inflatable structures, makeup and balloons for children.